Boycotting the Goods of the Jews & Trading with the Enemies – By the Scholars: Bukhaaree, Ibn Hajr, Fawzaan. 23rd July 2014 Abu Khadeejah Abdul-Wahid Fatwa, Politics and Rulership, Society Comments Off on Boycotting the Goods of the Jews & Trading with the Enemies – By the Scholars: Bukhaaree, Ibn Hajr, Fawzaan. Do we really need to pay attention to these slogans and images?? There is much discussion in our times involving politically and emotionally charged youth (urged on by the political organisation known as the “Muslim Brotherhood”) eagerly compiling lists of businesses that have links to Jewish companies or to Israel itself, or those who trade with them. It is claimed that it is haraam (forbidden) to trade with these types of companies. In fact, even to shop at supermarkets which stock products produced by Jewish or Israeli companies is treachery towards Islaam and the Muslims of Palestine [or so they claim]. In it is a permissibility to buy the merchandise of the disbeliever, and an affirmation that he owns what is in his hand. Also that it is allowed to accept a gift from him. Shaikh al-Fawzaan and Boycotting Products from the USA on the basis that the US supports Israel militarily. In the attached audio clip below (from a few years ago), Shaikh Saalih al-Fawzaan (hafidhahullaah) was asked concerning what was printed in some newspapers wherein was found a call to boycott US goods on the basis that the USA supports Israel. And it was claimed that this verdict was issued by the Scholars and that it is obligatory upon every single Muslim to boycott the purchase of those goods, and that the purchase of any of these products is completely forbidden. 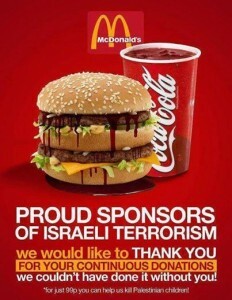 Indeed the one who purchases these goods is a person of major sin on the basis that the purchase of these goods aids the Jews in fighting and killing the Muslims. And all praise is due to Allaah, the Lord of creation.